…is to have a good Samaritan nearby use the Heimlich maneuver on your desperate person. Better yet: don’t swallow it in the first place, so you’ll never *need* to hack it up! Take my nanowife, please! No, seriously folks, I just purchased my first cell phone. For two dollars and fifty cents…such a deal! I selected the sexiest from the lot of ’em, at a thrift store on Duboce and Church: “Out of the Closet”. Now, all I needed was a phone charger and I’d be in business…which charger BTW, cost far more than the phone itself. Why did I buy a used cell phone? Why didn’t I just go the regular subscription route? Only because–as one who is dead set on never acquiring this new-age albatross to tether me down to a chattering network of inane blathering for a highway robbery sum–I also saw the good in acquiring a diminutive handset, just for the sake of 911…which number by law, every cell phone is required to access, *including* those that are not subscribed. 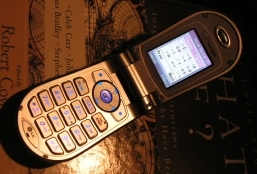 Mine is the Verizon LG VX4600, which debuted waaay back in 2003. It’s in excellent condition, battery just fine. But now that I own a cell phone, I want to *play* with it, outside and beyond the subscription realm. Or IOW, I want to learn how to *hack* the precious little silver hand robber. Free as in dandelion necklaces.